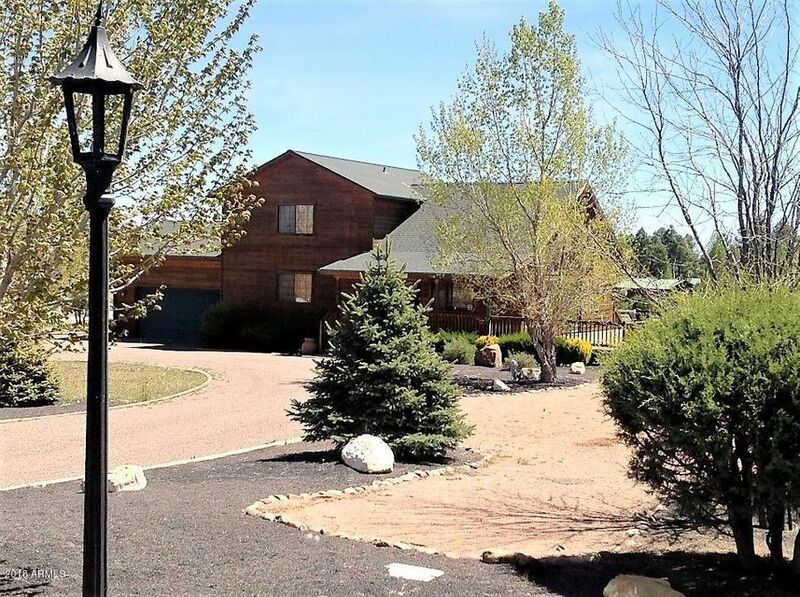 All Overgaard homes currently listed for sale in Overgaard as of 04/24/2019 are shown below. You can change the search criteria at any time by pressing the 'Change Search' button below. If you have any questions or you would like more information about any Overgaard homes for sale or other Overgaard real estate, please contact us and one of our knowledgeable Overgaard REALTORS® would be pleased to assist you. "STONEYBROOK RANCH!!!! 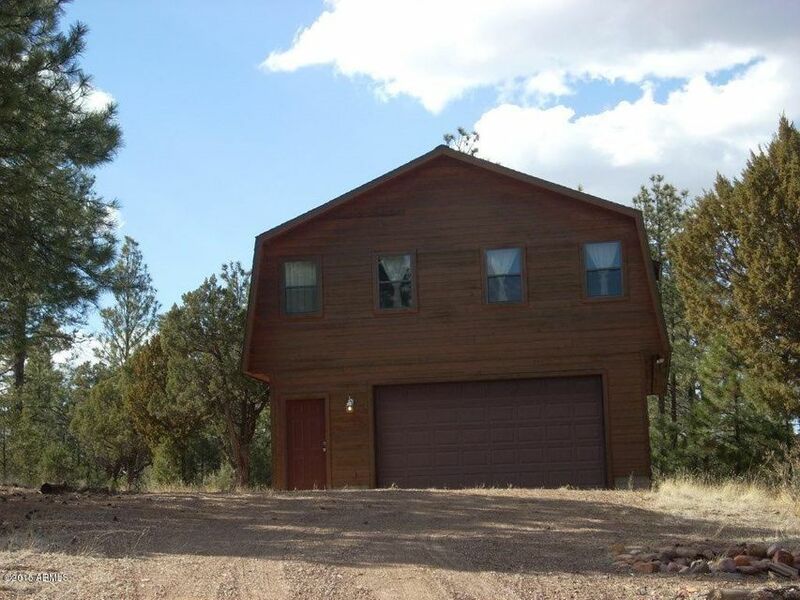 This 25 acre property is located between Heber-Overgaard and Show Low. 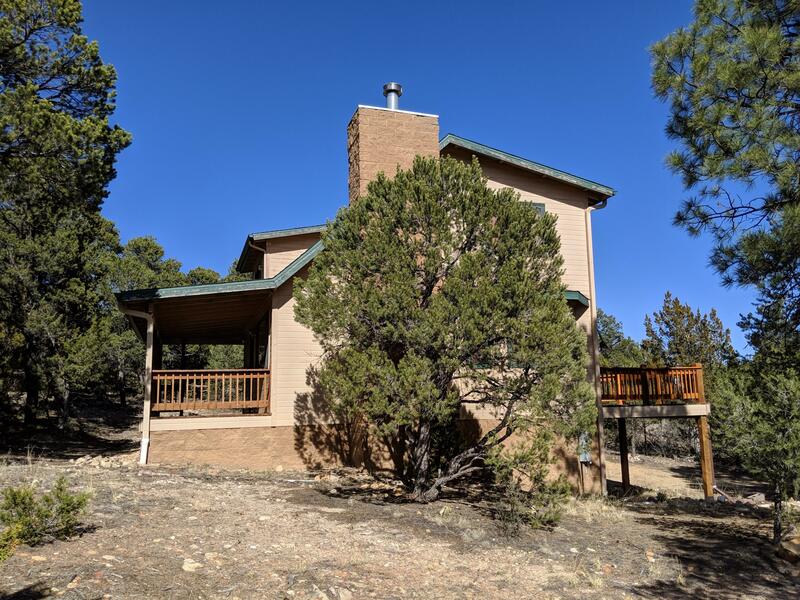 The property is completely fenced (6' white painted steel) for your seclusion and privacy adjoining the Sitgreaves National Forest. 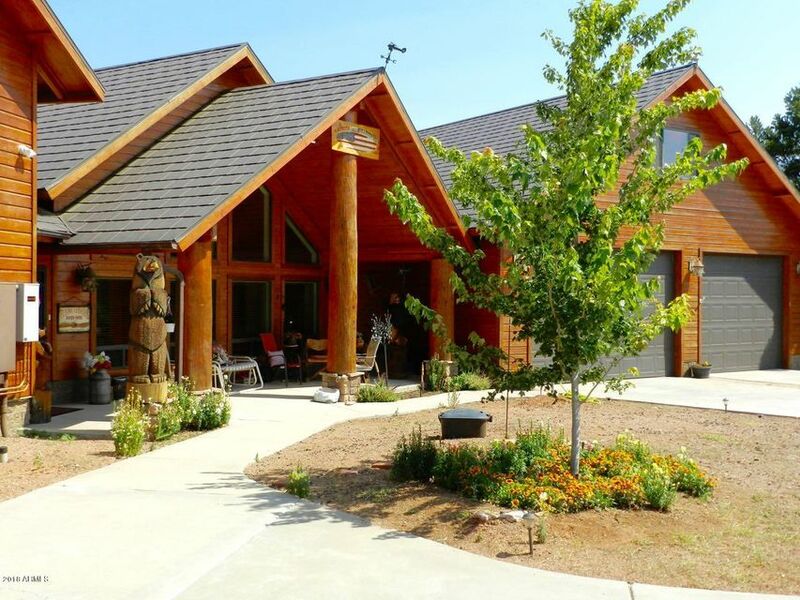 Your 4 BD 3 BA log home was remodeled in 2005 with all the best technology imaginable. Enjoy the covered deck that overlooks the beautiful lawn and flowers. The 80 X 44 steel constructed barn was built in 2005 with 6 oversized (16 X 16) stalls, a wash bay with hot and c"
"AVIATORS! 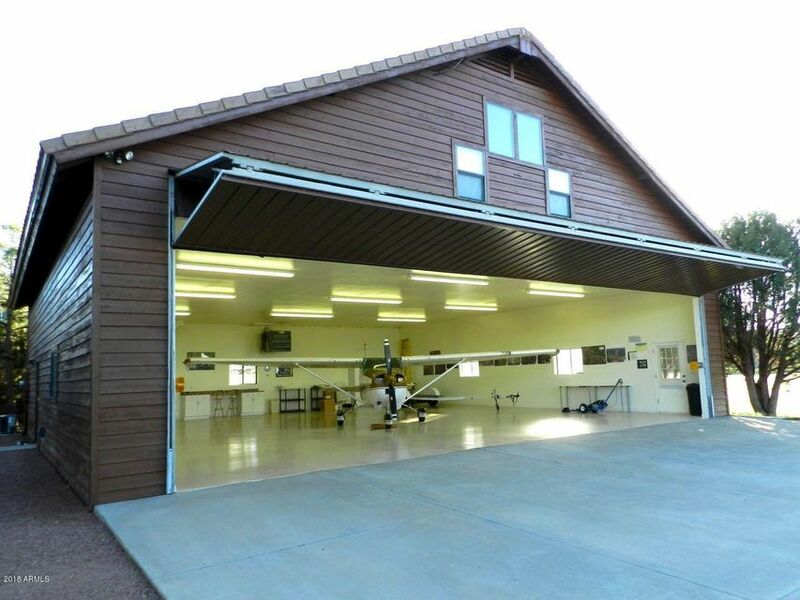 Your dream home and hangar awaits at the Mogollon Airpark. This PREMIUM home and hangar is located on a 0.89 acre lot a the NW end of the parallel taxiway. 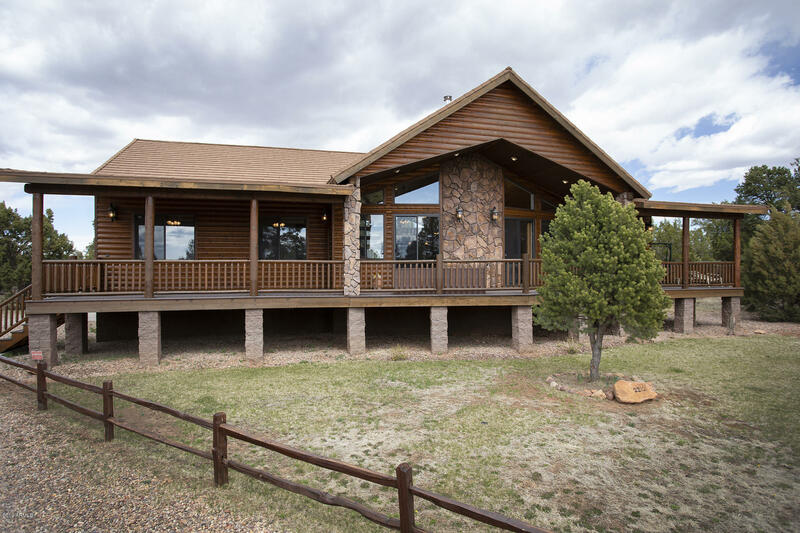 The recently stained log sided home features a large open kitchen, combo dining/great rooms with a central fireplace and TV room. A large master suite with fireplace is on the main floor. Lower level includes 2 bedrooms, 2 baths, game room, and family room. Large private covered decks with a Jacuzzi. The massive hangar includes a"
"Why wait? 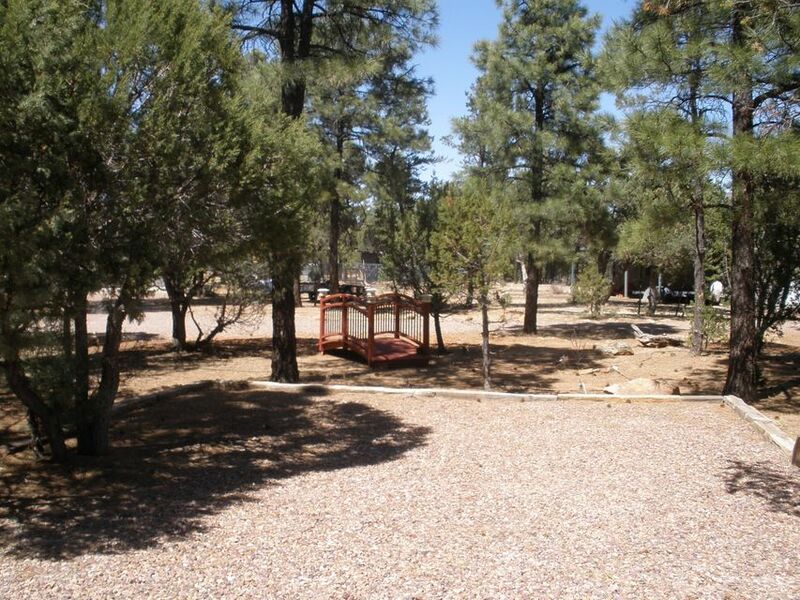 NOW is the time to purchase your dream home at the prestigious Mogollon Airpark (AZ82). 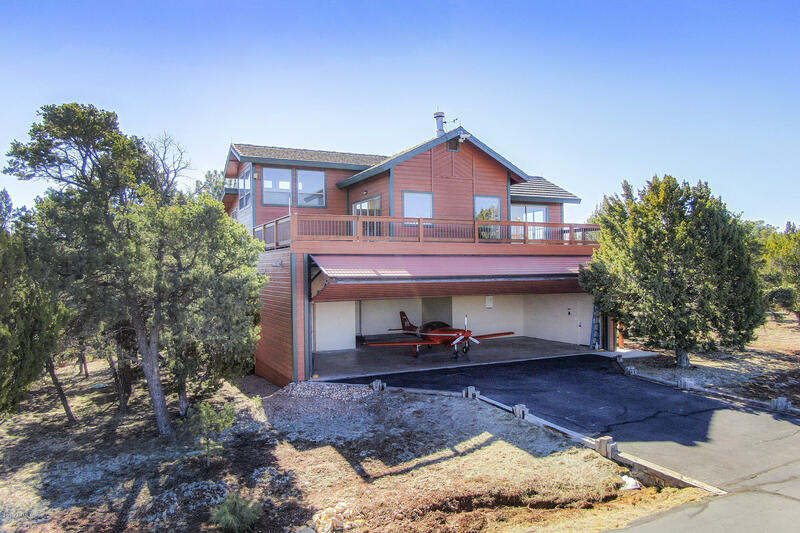 Beautiful 3800 sq-ft, cedar sided chalet with large hangar is located on a 0.84 acre treed, fenced and beautifully landscaped corner lot. There is room for everyone to relax in the huge great room, cozy up to the stunning floor to ceiling rocked fireplace with pellet stove. 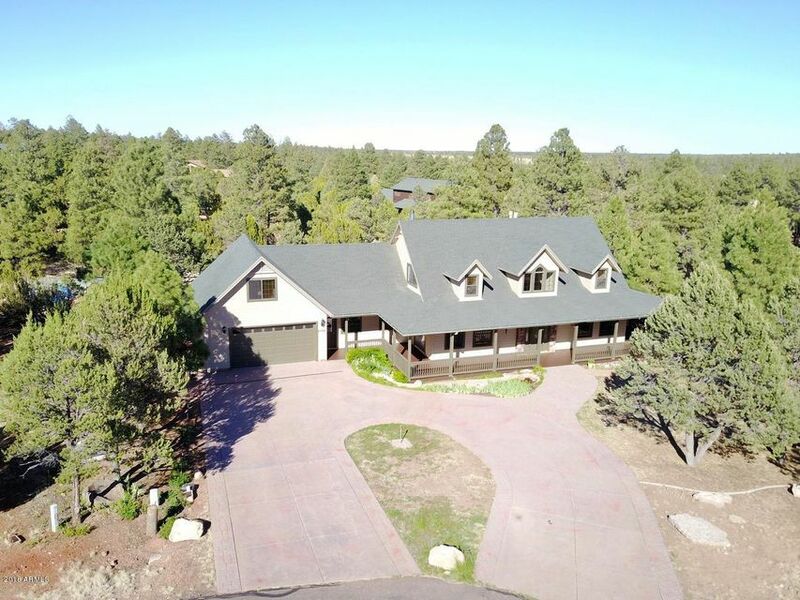 Gorgeous wood vaulted ceilings, easy to care for ''wood'' porcelain tile floors, wet bar for entertaining, and a huge formal di"
"This Luxury Cedar Sided Custom home is situated on 1.2 acres of Tall Pines on a cul-de-sac in the Mogollon Airpark. In one word, ''Breathtaking!''. Features include spacious Living Room w/cathedral windows overlooking the heavily forested lot. Dream Kitchen with Jenn-Aire stove, BBQ grill and double oven. Master Bedroom suite with Jacuzzi garden tub and walk-in closet. Rich warm oak hardwood flooring and cabinetry. Stone faced gas fireplace with thermostat, carpeted Loft family room, radian"
"Larger than life Family Retreat! 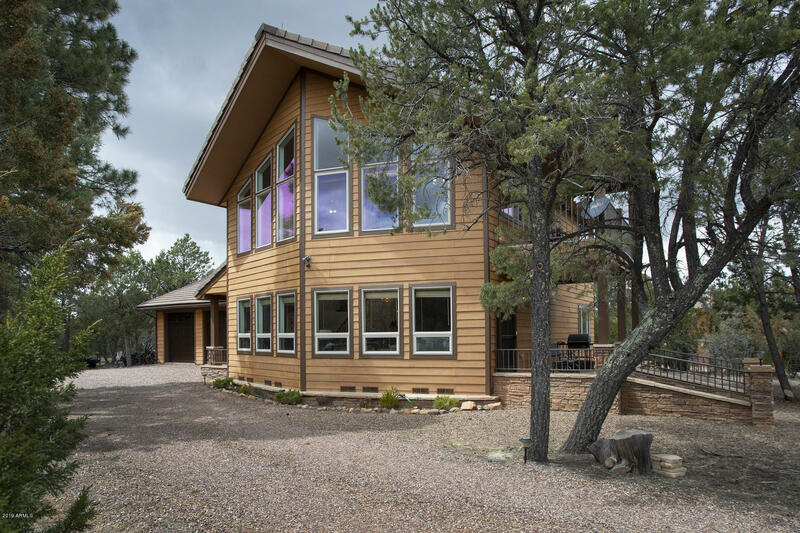 A beautifully secluded custom home framed by a 3.5 acre heavily forested homesite. Oak flooring, hickory cabinets w/sliders, gourmet kitchen with granite and SS appliances, knotty alder interior doors, solid oak baseboards, tiled and carpeted flooring. 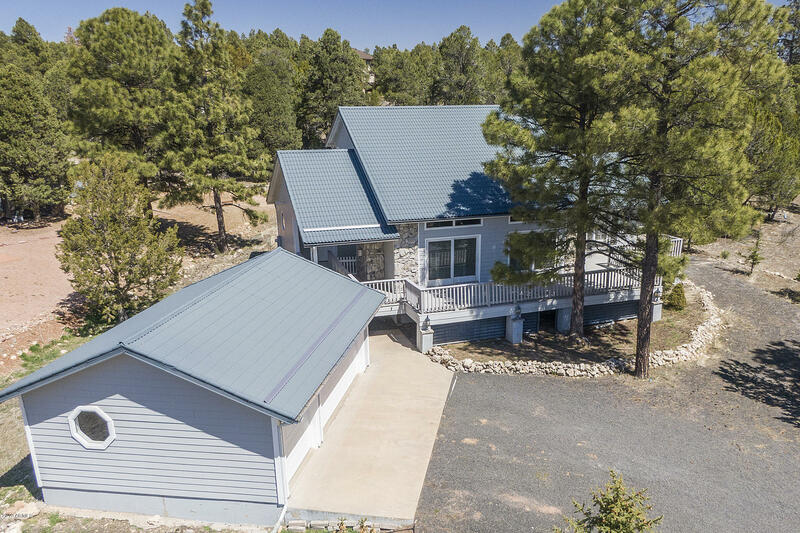 Property is entirely fenced w/an electric gate, heated garage w/a workshop and half bath, a separate craft/workshop, 3 car/RV covered carport w/hookups, metal roofs on all structures, gazebo w/ built in BBQ, and PR"
"Calling all Aviators to the Mogollon Airpark!!!! Time to enjoy this super constructed Chalet, built out of structural foam panels, super insulated and a cement tile roof. Plenty of room for all your family and friends-huge loft with magnificent views and a private covered patio. Bonus room that could be your library or forth bedroom. Granite counters in spacious kitchen. Plenty of storage in the THREE car attached garage. For the pilot the short walk across the street is your dream hangar,w"
"When you think about what makes -The Perfect Cabin- perfect you might think about a great room with dramatic ceilings and a fireplace with a log mantle and a floor to ceiling stone hearth. A big window wall to bring the surrounding Ponderosa Pine Forest indoors is a must! You might imagine a big kitchen with a center island cook-top/griddle, double ovens and big breakfast bar. There's A Big Eatin' room - the place you'll gather. A large loft with a game table overlooks the great room. Log posts"
"Seeing is believing, a birds-eye view of wild life and aircraft operating from the prestigious Mogollon Airpark. Watch the action from your deck or while tinkering in your hangar. The 2,280 sq-ft hangar home is located on a 1-acre cul-de-sac lot on the northeast parallel taxiway with plenty of space to expand.Kitchen features a breakfast bar, tile counter tops, gas oven/range, dishwasher, microwave & refrigerator. Adjoining living room w/fireplace is furnished in a casual and comfortable style"
"''SPECTACULAR PANORAMIC VIEW'S'' to be enjoyed from the large covered deck. 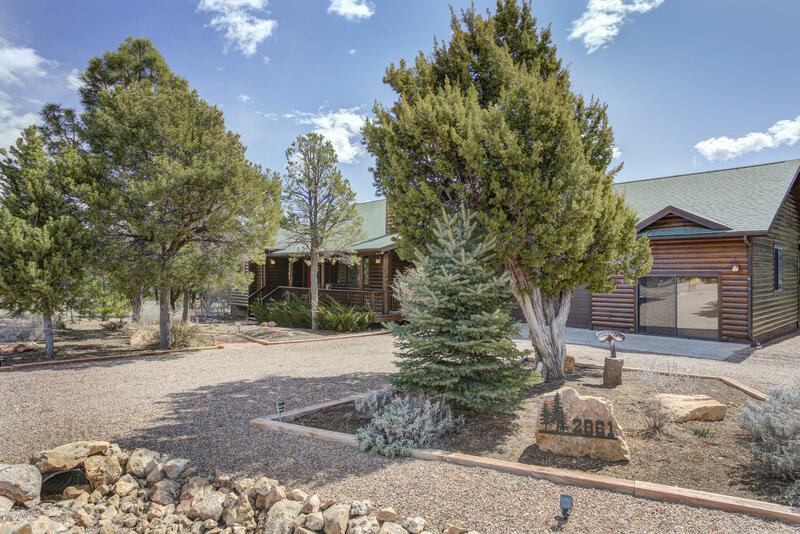 This pristine custom built log sided home located in the prestigious Mogollon Air Park boast 4BR, 3BA a large kitchen w/upgraded appliances, walk-in pantry & custom cabinetry. The open floor plan has a large great room with a floor to ceiling stone faced fire place, vaulted T&G ceilings, separate laundry room and an attached 2 car garage. This PRIVATE AIR PARK association offers clubhouse, tennis courts and landing right"
"Incredible custom home on nearly an acre tree-studded lot in a homes only area; 3BR/4BA; formal dining room; game room; bonus room; huge covered deck in back; covered patio in front; fireplaces in GR & MBR; Amazing MBR suite; 2 bedrooms with full baths; office; custom cabinetry throughout; oversized garage; landscaped yard; freshly painted inside & out; all new stainless steel appliances; new granite countertops; and so much more." "Watch all of the action from your Mid-Field 50' x 50' Hangar with a furnished 700 sq-ft apartment above located on a 0.95-acre home lot at the prestigious Mogollon Airpark (AZ82). The apartment features an eat-in kitchen with granite counter tops, gas oven/range, dishwasher, microwave and refrigerator. The adjoining family room is furnished in a casual and comfortable style. Skylights and solar tubes provide daylight lighting throughout. The bathroom features a beautifully tiled shower and ti"
"This log sided beauty has been well maintained! You'll enjoy the open greatroom with well laid out kitchen for family gatherings, knotty alder cabinets, large center island with vegetable sink and double breakfast bar in this 3 bedroom, 2 bath split floorplan single level home. 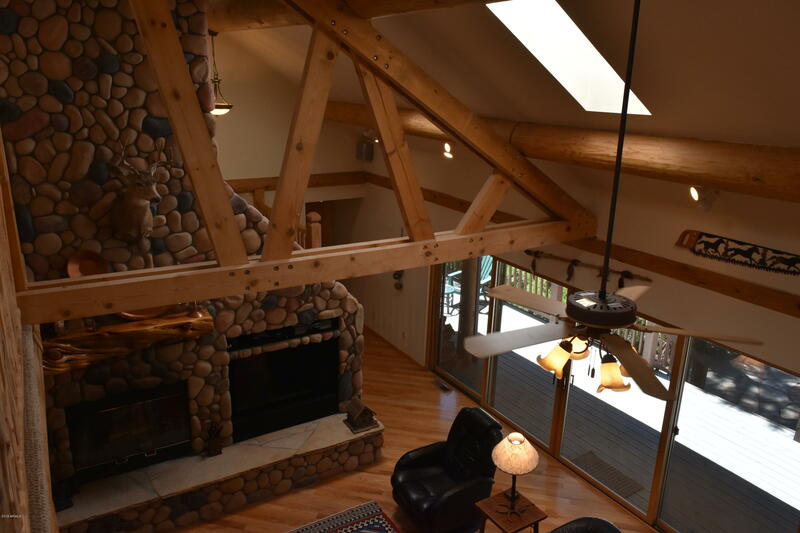 Vaulted T&G ceiling with lodgepole wood beam, warm pine interior doors & trim accentuates the floor to ceiling river rock faced wood burning fireplace. Perfect for year round living with central propane heat, A/C, Attache"
"Beautiful log sided cabin on heavily treed .80 acre lot. Back yard is fenced and also has a fenced garden area. Large upstairs master with sitting area, 2 closets and balcony. Kitchen has island and the stainless steel appliances are 5 years old. Pergo XP flooring, tile in kitchen, bath & laundry room and carpet in bedrooms. Screened in sunroom with 2 ceiling fans. Yard is on drip system. Parking for 2 RVs. Roof and outside painted in 2016. Outside shed with shelves for storage. 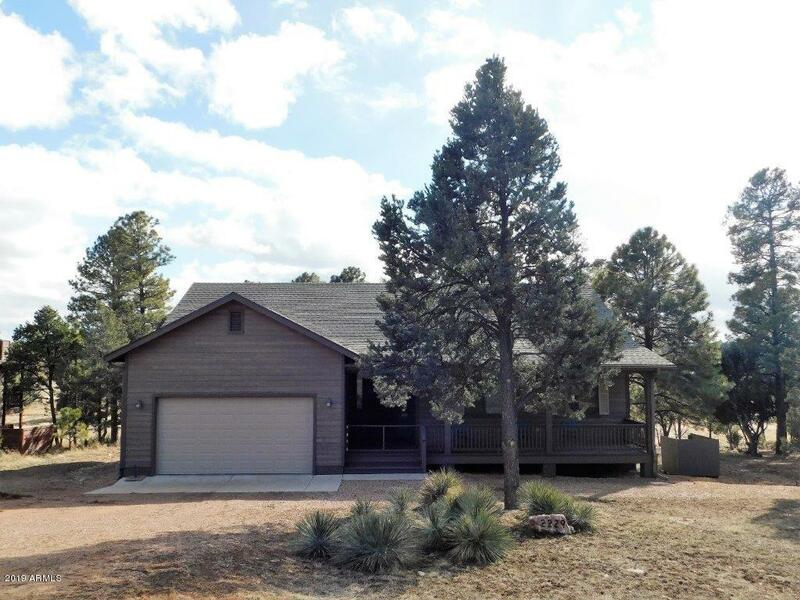 Rose bu"
"''PRISTINE RANCH STYLE HOME'' This home is located in Pine Meadow Country Club Estates w/paved roads, sewer, has no maintenance wood look siding, trex decking and is just minutes from the National Forest. It boast 3 Bedrooms, 2 1/2 Baths, an open floor plan that is great for entertaining, central heat & A/C, ceiling fans through out, upgraded laminate flooring, a large covered front deck and back deck that sits right on the Fairway with stunning views, a large multipurpose cement slab which make"
"Spacious cabin on hard to find oversized lot! Enjoy the open-concept floorplan which is perfect for entertaining. Great Room has vaulted T&G ceiling, rocked fireplace and french doors to large deck. Convenient downstairs master; large loft area upstairs provides overflow guests. Circular drive has room to park RV. 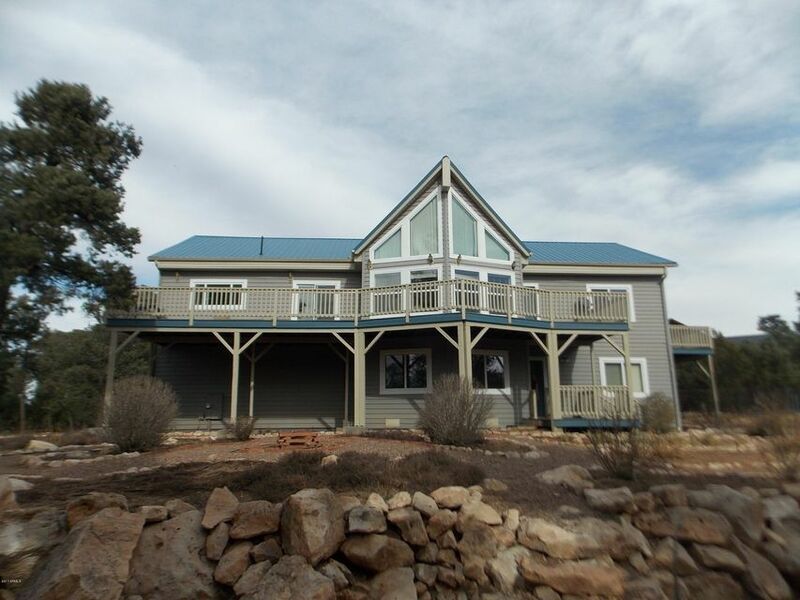 Cabin sits on 1.45 acre; front of lot is beautifully landscaped. Huge backyard is a blank slate for your patio and landscaping dream! Seller is also providing a transferable home warra"
"Plenty of privacy and room for entertaining all your family and friends in this home located on a corner lot with circular driveway!!! From the time you enter the downstairs with a large family room and gas fireplace you realize the spaciousness of the home. TWO large Bedrooms, a full bath and large laundry room all on the lower level. UPSTAIRS - spacious livingroom with vaulted ceiling and gas fireplace and a wall of windows for forever views!!! Formal dining room with access to the wrap ar"
"Remodeled !!!! 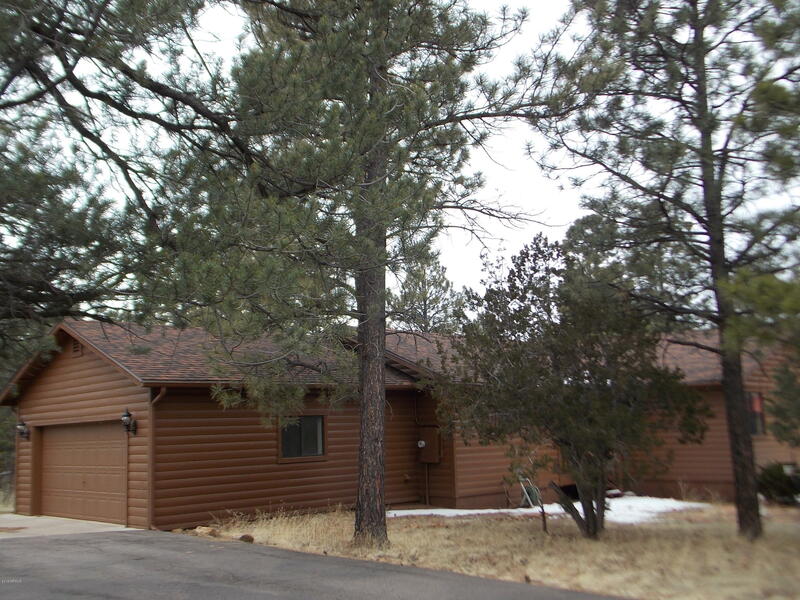 Single level log sided cabin in the pines located in very popular Forest Trails!! This 3BD 2BA open floorplan has new granite counters throughout, custom tiled showers, new flooring, paint, appliances and a new roof in 2018. Attached finished 2 car garage. Great back covered deck for entertaining with friends and family. Homes only subdivision-paved streets. 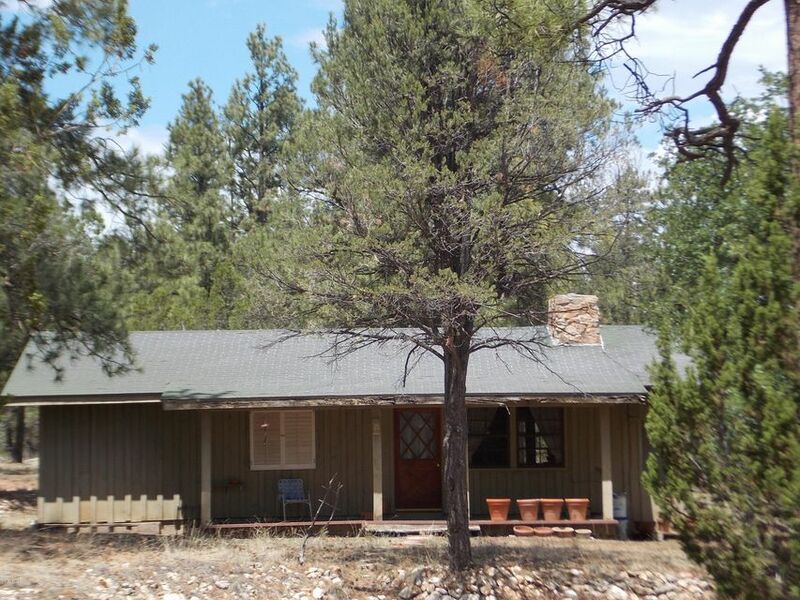 Owner Agent"
"Beautiful and well maintained 3 BR/ 2 BA cabin in Overgaard. This home features a great room design with a wall of windows, freestanding wood burning stove, hardwood maple flooring, hickory cabinetry, ceiling fans, a huge loft, baseboard heating, wired for audio, internet and phone hookups in every room, exposed wood beams, and vaulted T&G ceiling. 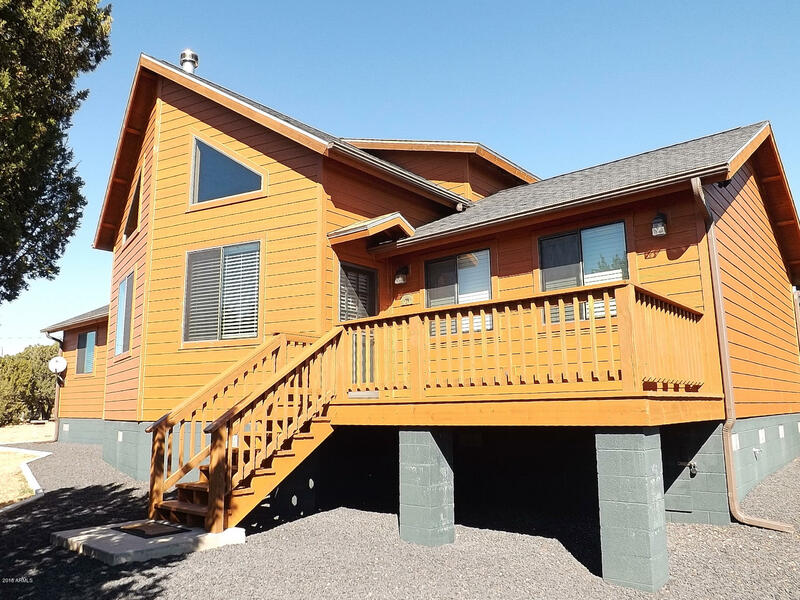 The exterior boasts brand new Louisiana Pacific smart siding, oversize gutters, a fenced backyard, a covered rear deck, curbing, walkways all around,"
"Close to USFS-heavily treed 3.99 acres in Buckskin Artist Community!!! 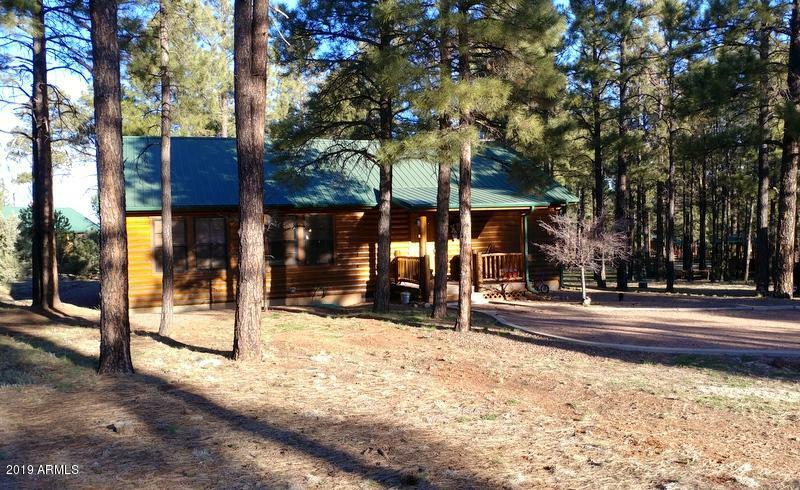 With a little TLC you could make your dreams come true and this could be your cozy cabin surrounded by tall Ponderosa Pines. Slate flooring-T&G-fireplace insert and blowers surrounded from floor to ceiling with rock-two large bedrooms and a sunken sitting room off the living room-so much potential!! Seller will not make any repairs-the property is offered in as is condition." "''Come take a look at this stunning home located in the desirable Pine Meadows Country Club Estates'' Inside offers 3 bedrooms, 2 1/2 baths, custom stone work throughout, peeled pole log accents, vaulted T&G ceilings, maple cabinets, gas fireplace in living room, large master downstairs w/double sinks in the master bath, guest bedrooms are Jack and Jill set up and much more. Outside is a large 3 car garage w/concrete pad, custom stone work on the exterior also, large wrap around deck, metal ti"
"A delightful mountain retreat! Newly remodeled flooring, countertops and sinks! 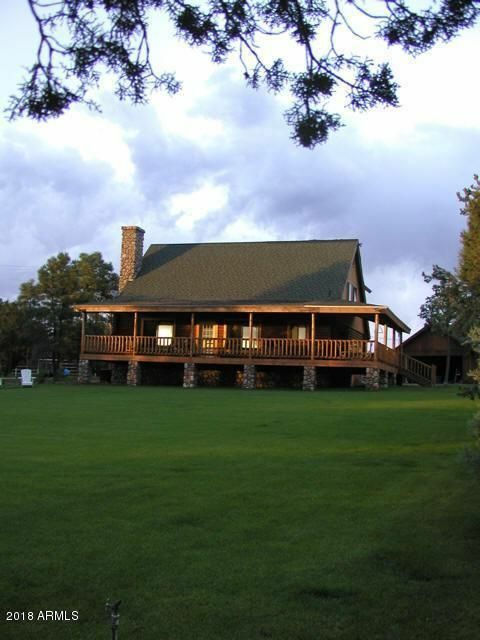 This beautiful country style cabin is surrounded by tall ponderosa pines. Featuring a large corner private lot with over an acre of towering pines nestled in the beautifully built community of Forest trails II, homes only subdivision. This home features a large open floor plan with vaulted ceilings, large front, rear and master covered patio decks. 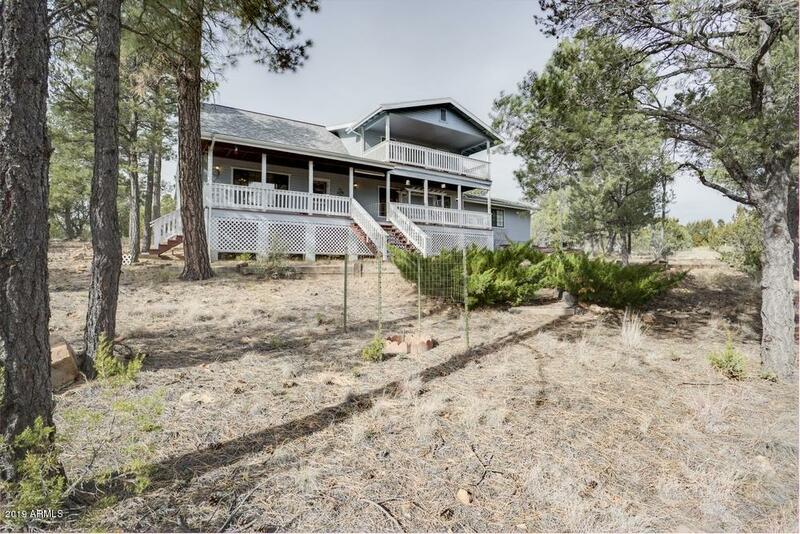 A spacious master bedroom suite which includes its own private bathr"
"A beautiful .98 ace lot with tall ponderosa pines surround this cabin and 2 car garage located in Bison Ranch. You will be greeted with a feeling of warmth and delight as you walk into the 3 bedroom, 2 bath cabin with wood trim, tongue and groove vaulted ceiling plus floor to ceiling river rock fireplace. Large living room, new bronze fixtures in baths, granite counter tops in kitchen and new refrigerator. 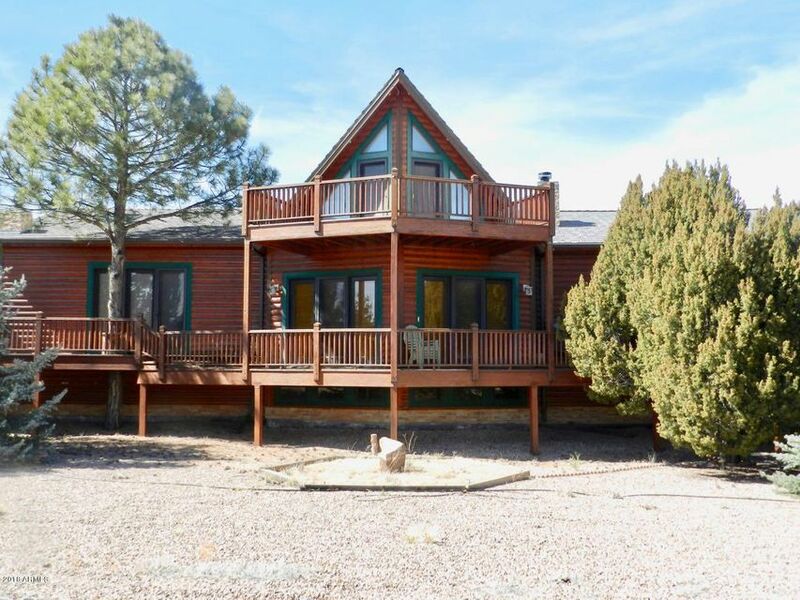 An expansive covered back deck to enjoy the beauty of the outdoors allow for relaxation a"
"Mighty Mountain Cabin at a mighty affordable price! On a densely treed, level to sloping 1/2 ac lot in one of the top ''Homes Only'' subdivisions of Heber-Overgaard. Loads of character, view decks galore, bright skylights, warm wood burning fireplace, full feature kitchen, full utility room, and full 652 sq ft drive-in basement with roughed-out plumbing, single car door with room for multiple vehicles and a whole lot of toys. Priced to SELL. Seller is AZ licensed Broker." "Looking for that wooded homesite with seclusion AND privacy? 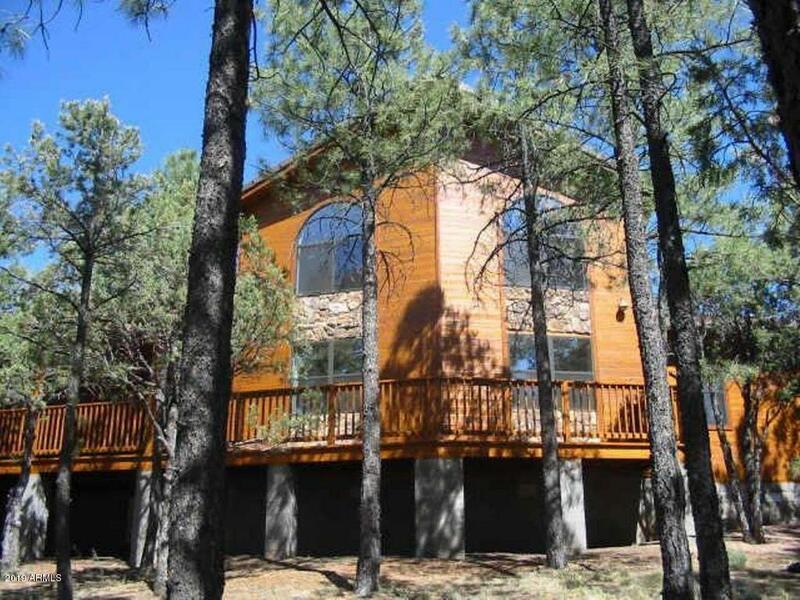 This tree studded 4.66 acres is loaded with towering ponderosa pines and an arroyo at bottom for wildlife viewing or relaxing on the balcony with tree top view. Adorable cedar sided single level cottage built over a spacious garage & workshop with tongue & groove interior, vaulted ceilings, open floorplan, light n bright, unobstructed views from all windows, tile flooring in all the right places with carpet in the bedroom. Toasty wood "